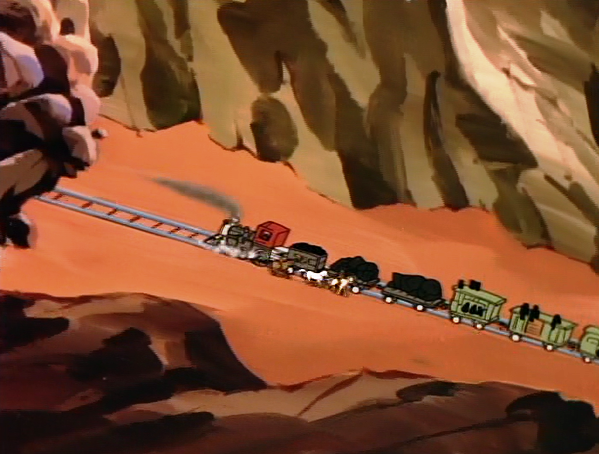 In “Last Train to Doomsday,” Thundarr, Ookla, and Ariel defend a locomotive from a Mummy, who actually turns out to be the two-faced Gemini, a deadly wizard. 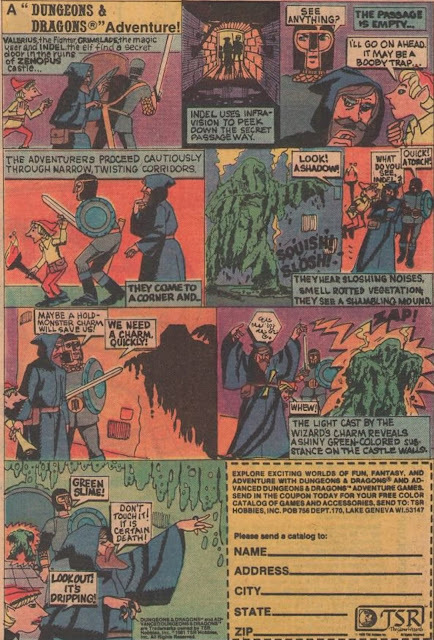 Still holding a grudge from his last encounter with Thundarr, Gemini captures the barbarian and traps him in a rock pool with silicon-based life-forms called the Silicoids. 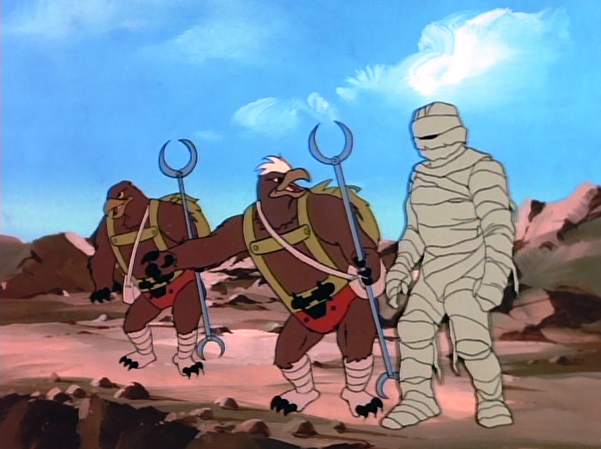 Unless Ariel and Ookla can rescue him, Thundarr will be transformed to stone…for eternity. 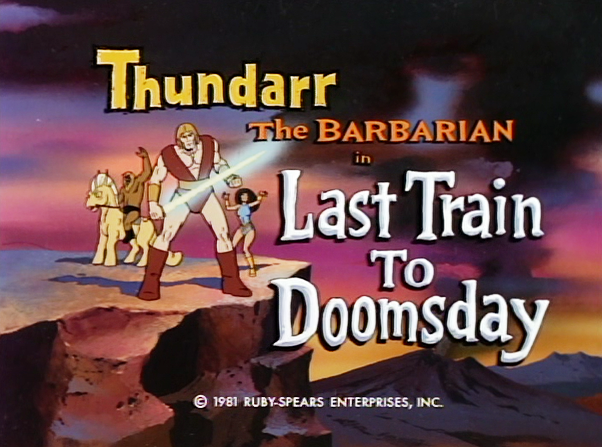 “Last Train to Doomsday” feels a bit like old-home week for Thundarr the Barbarian (1980-1981). Less impressively, “Last Train to Doomsday” also reruns the central threat from the episode with Circe (“Island of the Body Snatchers”), that of being transformed into a statue. 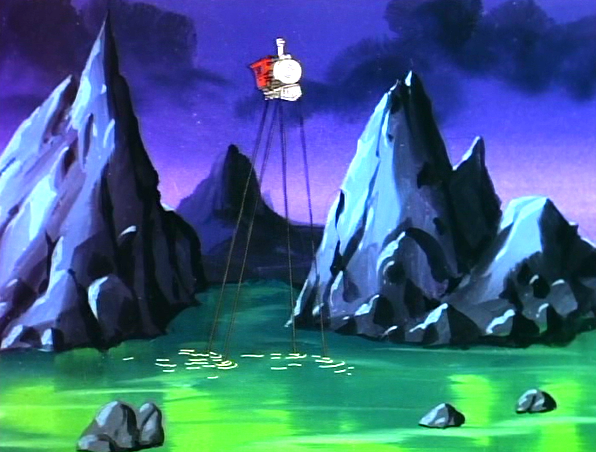 Still, there are some good touches in this installment, including Gemini’s use of “acid rain reservoir” to threaten the heroes, and also Ariel’s powerful magic, which turns a runaway train into a walking vehicle on the equivalent of stilts. That’s something you don’t see every day: a walking locomotive engine with long steel railroad metal for legs. The best touch, however, is a brief tribute to Marvel Comics, home of series mastermind Jack Kirby. 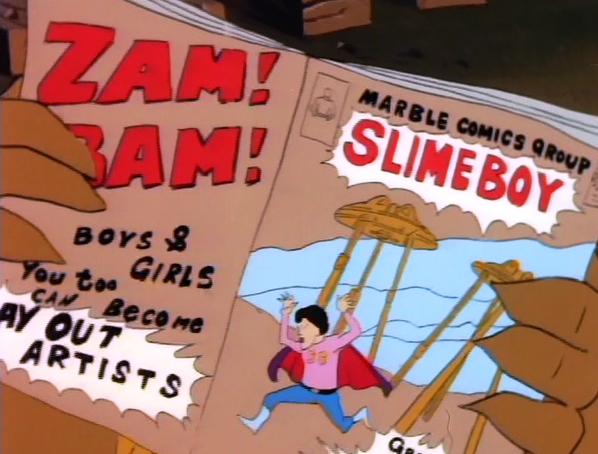 At one juncture, Ookla stops to read an ancient “Marble” comic-book titled Slime-Boy. He promptly breaks up with laughter. That’s the kind of touch that renders Thundarr the Barbarian a delight more often than not. Although I wish this episode featured more certainty in terms of its post-holocaust locations, a frequent pleasure of the series, it’s nice to see the throwaway Marvel Comics homage. Less pleasant is yet another sexist touch. Thundarr dismissively scoffs “Females!” at one juncture, and it’s irritating to see that male chauvinism has endured two centuries and a global catastrophe. Oddly, 1970s-era slang has also endured this span. “Let go of me, you turkey!” shouts on character here. John I am glad that you are reviewing THUNDARR. If Filmation had made the second season of ARK II as an animated series which it was supposed to, then I am sure it would have been like THUNDARR with interesting locations.